After reading, on social media and in story comments, various people discussing why people were protesting I became uneasy. I had a feeling most of these folks had never actually asked any of the protesters that simple question; why? Or, as I decided on the fly; why and what do you hope the protests accomplish. I don’t know what I expected in answer. I didn't know why either. I also didn’t notice my autofocus was off and that there was some loud horrible buzz that burst out at various points on the audio once I started shooting. Nonetheless, despite the shite quality, I talked to ten people. 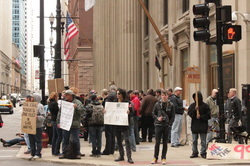 This was on a Monday afternoon, October 17, 2011, around lunchtime, outside the Federal Reserve Bank in Chicago. I didn’t ask names, I didn’t ask affiliations I only asked—Why are you here/what do you hope to accomplish? It was not a large crowd (several hundred protesters had been arrested for violating a city ordinance on Sunday—they wouldn’t leave Grant Park when it closed at 11 p.m.). I talked to people in the main group, people off to the sides, people there, obviously, by themselves. None of this is edited and I am not, actually expressing any opinion of my own in these videos. I talked to some of the people after I interviewed them and maybe sometime later I will keep the camera running while I do that. But not for now. This is, I suspect, the first of a few times I will do this. I confess, I probably should have prodded some people to stay on point or asked a follow up question but I decided to keep it simple. Don’t draw conclusions from ten people. But they are ten people who took the time to take part in something very American—free expression. I have to add, as a postscript, that it is tough for people to have a mic stuck in their face and asked a very general question on hope of getting very specific answers. Not one person I asked refused to express an opinion. I hope there will be a number of similar interviews with people protesting for change.